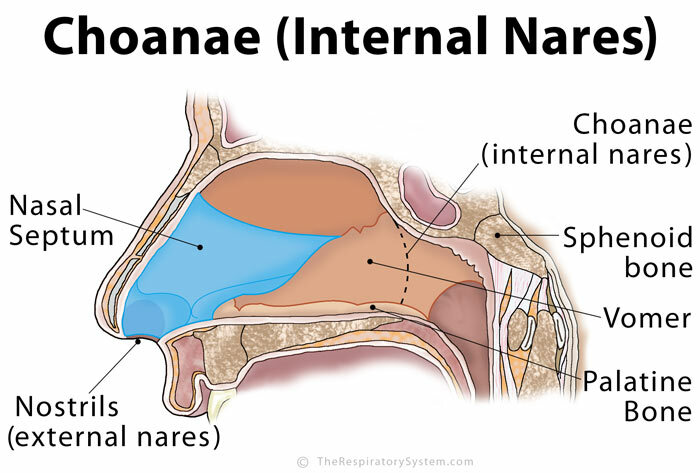 A choana (plural: choanae) is one of the two apertures at the back of the nasal cavity that opens into the nasopharynx, the open space behind the nasal cavity in the airways . It is also known as the posterior nasal aperture, and the internal or posterior naris (plural: nares) . The thin trapezoidal bone, vomer, located behind and beneath the nasal septum separates the two choanae in the middle . They are surrounded in the front and the lower side by the palatine bones (horizontal plate), while the sphenoid bone forms the upper and back borders of the internal nares. The sides are bounded by the medial pterygoid plates . Their primary purpose is to transfer the air inhaled by the nostrils and purified by the nasal cavity down into the nasopharynx, so it can then pass into the next parts of the airways, the larynx, trachea, and bronchi to enter the lungs. Similarly, at the time of exhalation, it is the passage for the carbon dioxide-rich air to exit from the nasopharynx into the nasal cavity to be excreted from the body [3, 5]. Choanal atresia: A potentially life-threatening congenital condition, affecting 1 in every 7,000-8,000 newborns, it is characterized by blockage or narrowing of the choanae that makes it difficult to breath . It occurs when the nasal passages fail to form properly during the fetal development. The exact causes are not known yet, with both genetic and environmental factors believed to be responsible . Certain corrective surgeries might help in less severe cases.